Last year I wrote a two-part article [ed: part 1 | part 2] on why khaki is a great spring/summer colour and how it could easily be deemed the perfect neutral. 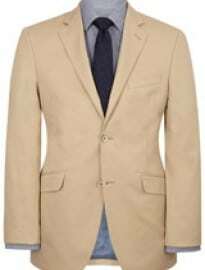 It is this versatility that makes a khaki suit such a great investment for the coming months. A khaki suit is able to provide the backdrop to support bright, pastel and even dark colours without looking out of place. In terms of pastel colours, consider blue, green and pink tones. Yellow, despite it’s current trend status, could be considered too close in colour – although this is all dependent on the shade in question. Pastel colours can help add personality to an outfit, and khaki will anchor them effortlessly. Pastels are also in keeping with the toned down nature and almost sun-bleached appearance of the suit; especially when lighter shades of khaki are utilised. For example, you could opt for a pastel pink shirt and blue pocket square to bring some lighter, sunshine appropriate style to your summer wedding looks. Alternatively, you could opt for a slightly darker, possibly patterned, shirt and then add a pastel tie to bring good balance to your neutral suit in the office. Brighter colours are easier to incorporate in a more casual manner, such as dressing down the suit with a t-shirt, but can possibly be utilised in a smarter ilk via subtle accessories such as socks, ties and pocket squares. This is also an opportunity to feature some on-trend patterns and prints, especially in the form of a statement t-shirt or shirt. It’s worth noting that these brighter pieces work best alongside a darker sand coloured shade of khaki rather than a paler stone hue. Dark neutrals set against a khaki backdrop provides a chic contrast, although in the heat you want to steer clear of large areas of black in order to stop your well thought out, practical suit selection being negated. A white shirt and black tie is a great way to strike this balance without heatstroke – as are making use of black shoes or loafers. 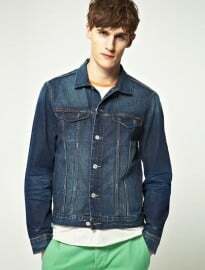 You could also opt for a blue chambray or denim shirt (if the weather is a little less Saharan) as a more smart-casual approach. A khaki suit is also incredibly proficient at working overtime and being split into separates. Whether it’s the top or bottom, the neutral shade can break free from its suited shackles and be let loose alongside everything from a check shirt to a coloured blazer to a varsity jacket. For example, you could ditch the matching suit jacket for a Riviera blue blazer or a more daring red equivalent with very little thought, yet the change would make a enormous difference to the overall complexion of the look. If your looking to make a more casual statement, pair the suit trousers with a casual shirt with the sleeves rolled up or even a t-shirt and cardigan combo. There is no reason why a good pair of suit trousers in a flattering fit can’t serve double-time as a casual option, especially in a cool cotton or linen weave. On the flipside the jacket part of the suit has a similar amount of versatility, although a blazer will always carry a smarter element than the trousers. You could quite easily pair the jacket alongside some coloured chinos, alternative neutral coloured trousers or even some shorts for a cooler summer suited outfit. By now I’m sure your getting the message that the khaki suit is the zenith in versatility, especially when it comes to colours and patterns. Sadly this sartorial shape-shifter does have it’s limits, as the khaki suit is often deemed far less formal than it’s more traditional navy, grey and black brethren. Certain offices could deem it too casual for work and it is often said that the khaki suit, not unlike a good pair of brogues, shouldn’t be seen after dark.